ANAHEIM, California – At NAMM 2015, HARMAN’s DigiTech is introducing the TRIO Band Creator Pedal, providing the ability to create a band that plays along with the user. 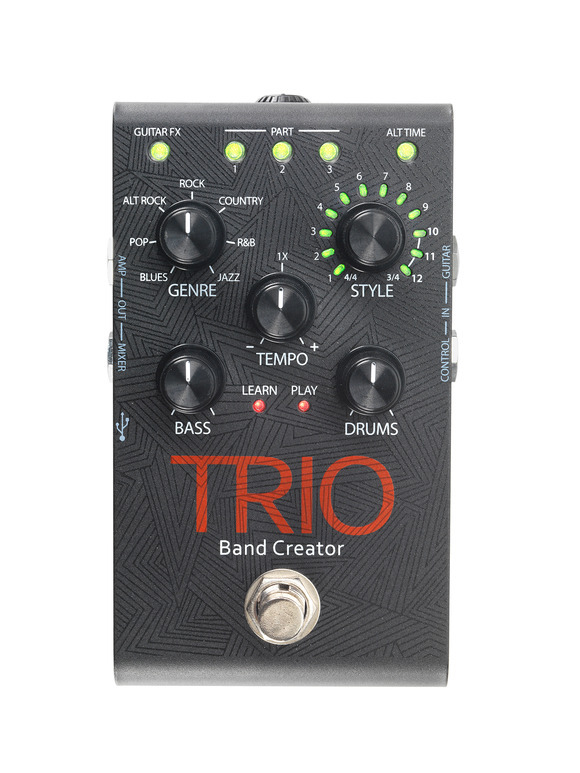 The TRIO Band Creator Pedal listens to what is played and automatically generates bass and drum parts that match chord progressions and rhythmic feel. Users simply need to plug a guitar into TRIO, press the footswitch to teach TRIO the chords and rhythm, then press the footswitch again to start playing with a customized personal band. The DigiTech TRIO provides seven musical genres to choose from including Rock, Pop, Country, Alternative Rock, Blues, R&B and Jazz. Up to 12 song styles are available for each genre and the player can select between 4/4 and 3/4 time signatures. TRIO can learn up to three different song parts – for example, verse, chorus and bridge – which can then be recalled on the fly as the song plays back. TRIO offers total control over the virtual band’s performance. In addition to its Genre and Style selector knobs, TRIO’s Bass and Drums controls provide volume adjustment for both instruments and the Tempo knob locks in the groove. The Alt Time button selects an alternate half time or double time setting for each song part. TRIO even provides a selection of built-in effects for your guitar that vary according to the genre selected, letting users play in a power trio, jazz trio or other ensemble at the touch of a button. TRIO can be connected to a guitar amp or directly into a mixer for use with a PA system. A headphone jack with level control is also included. An optional DigiTech FS3X footswitch can be connected to the TRIO for hands-free selection of song parts and styles. The TRIO comes with a power supply and its rugged-stage-worthy metal enclosure ensures reliable operation gig after gig. The DigiTech TRIO Band Creator Pedal will be available in March 2015 at a suggested retail price of $224.95.